Thankfully Charlotte isn’t a town where you need to sacrifice your firstborn to score a seat at brunch. But that doesn’t mean there aren't brunches worth going the extra mile for. There’s plenty of patio seating, boozy juices, and all-you-can-eat options to satisfy the never-ending quandary that occurs when you sit on the border of breakfast and lunch. And here are the best of ‘em. Every brunch should be accompanied by large mugs of coffee and good music. At littleSpoon in Myers Park, you get all that and more. 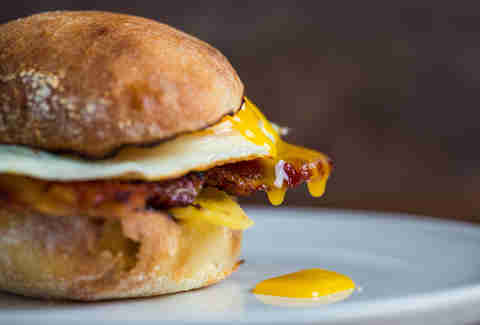 This neighborhood spot flaunts tasty creations like the #BEC, a golden runny-egg sandwich loaded with bacon and Cheddar, and Cinnamon Toast Brulee, a French toast-like creation that is way better than the cereal of your childhood. It’s quite possible that you spent Saturday evening clinking glasses and toasting the beautiful people inside the swanky bar at 5Church and, come Sunday, you’re operating at half-speed. Not to worry. Put on your aviators and head back for brunch, where you can sip a glass of bubbly and devour a croque madame or the famed lamb burger. Nothing cures a big night out more than a little hair of the dog and mornay sauce with French fries. The family-owned restaurant on East Blvd lives inside a house that was built in 1900 and has a regular crowd that feels like it's been there just as long. One of the biggest draws is the inviting patio, which fills up fast. Come early to avoid a wait and spring for the Crab Cake Benedict with citrus hollandaise and potato pancake. 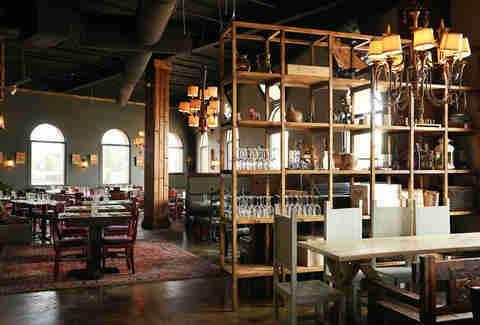 The atmosphere at The Asbury gives the feeling of Uptown elegance inside its light gray walls, while its brunch menu screams of down-home comfort. 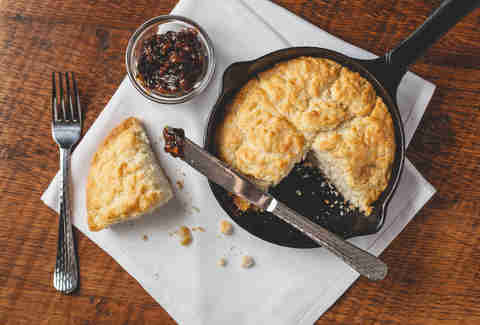 Start your meal with an order of Maw Maw’s cast-iron biscuits served with a side of savory bacon jam. 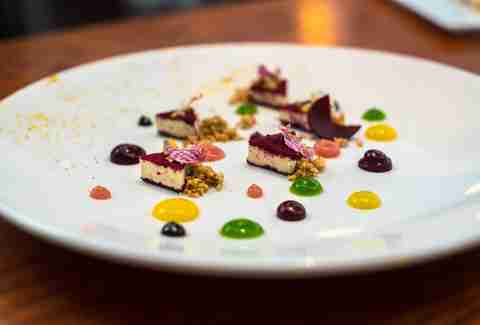 The menu changes seasonally, so be sure to check their website for the latest offerings. 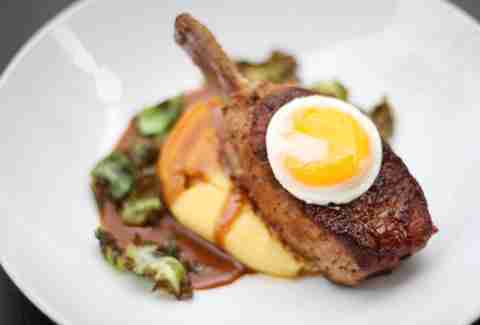 Step into this SouthPark stalwart with the upper crust of Charlotte and get your money’s worth. This upscale seafood restaurant does brunch right with an endless supply of sushi, oysters on the half shell, shrimp, clams, and mussels along with a luxurious selection of small plates like French toast topped with fruit and cashew crusted trout, all included in the $27.95 price tag. 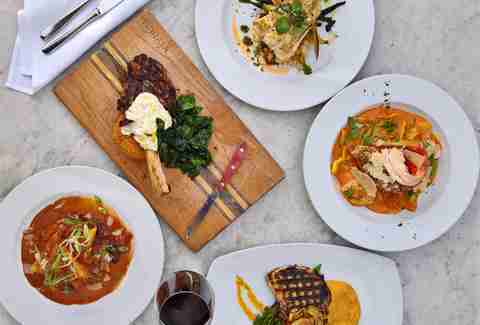 Bistro La Bon is situated on the lively Central Avenue thoroughfare in Plaza Midwood and offers two types of brunch experiences: a reservations-only affair on Saturdays and the Sunday Brunch Smorgasbord (which is where the action is). The internationally inspired restaurant offers a buffet that’s overflowing with European specialties, and $22 pays your admission to party. Head north of the city into the charming college town of Davidson where Fork! sits just on its outskirts in a most welcoming old house. 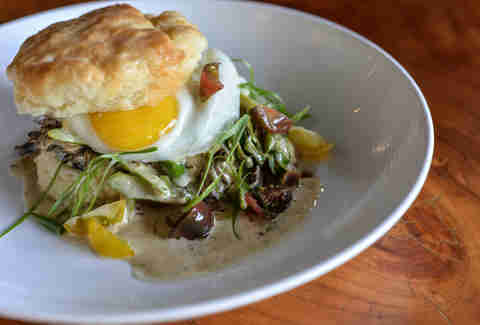 Dig into the mother load of Benedict selections (there are three on the menu) or try the Cheddar Herb Biscuits & Gravy. Pro tip: snag a table on the wraparound porch; it makes everything taste better. 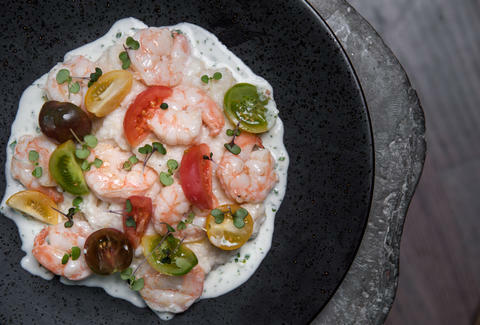 Though the drive to Waxhaw is always worth it, a Sunday drive to visit Chef Paul Verica inside his hyperlocal restaurant is that much more pleasurable. The big deal at brunch is the house-made doughnuts, which change weekly and the 'Hangover' Helper, a headache-fighting, belly-fortifying combination of bread, pimento cheese, bacon, pulled pork, a fried egg, and crispy onions. For a Parisian escape, get lost in the menu at this adorable bakery and bistro on a weekend when you have nowhere to be. Be sure to order the signature Benedict Monte with smoked ham, two eggs, tomato, asparagus, and hollandaise served on a flaky croissant. With two locations -- both offering brunch -- Reid’s is a SouthPark standout with an impressive patio and an even more impressive brunch buffet. Served every Sunday from 10:30am-2pm, it offers all the favorites: farmers pie, French toast, an omelet station, eggs Benedict, and more. You’ll want to save room for seconds. With views of the Uptown skyline, Vivace is a perfect destination for cocktails and a brunch-induced coma. Get a two-course brunch and bottomless mimosas for just $25, or snag something special from the Bloody Mary bar. You can also order a la carte, but the prix-fixe deal is too good to pass up. You’re probably thinking, “Seriously? Another buffet?” Bear with us. This $25 French-inspired buffet on Sundays will net you ever changing buffet options, including oysters, omelets, and crepes... or you can order a la carte. Whatever you choose, you should ask for the $12 bottomless mimosas to complement your meal... and start your Sunday off right. Erin Maddrey believes in the trifecta of awesomeness that is brunch, stretchy pants, and naps on the weekends. Follow her and her Charlotte adventures on Twitter and Instagram @ErinMaddrey.